Although the first Sailors and Marines won�t actually step aboard USS San Antonio (LPD 17) until the year 2002, the first amphibious ship to be designed for the 21st century already reflects their input. The LPD 17 Class of Amphibious Transport Docks will be the product of many excellent ideas furnished by hundreds of Navy and Marine Corps Fleet operators, maintainers, and trainers through the Design for Ownership (DFO) process. With months to go before the actual keel is laid, Team 17 (NAVSEA�s Program Office for LPD 17) has assimilated these contributions into LPD 17 Class ship and system design improvements. The 12 ships of the LPD 17 Class will replace four retiring amphibious ship classes. With a length of over 680 feet and a beam of 105 feet, the LPD 17 Class will be substantially larger than the LPD 4 (Austin) Class. It will be able to carry approximately twice the number of Marine vehicles, along with approximately the same number of troops, cargo, and ammunition space, as the older LPD 4. The increased beam size will permit a larger flight deck able to support, from its aviation spots, all aircraft in the Marine inventory. The diesel-powered LPD 17 Class will also have the size and support facilities for future planned Marine aircraft, including the tilt rotor MV-22 Osprey. LPD 17�s well deck, stern gate, and ballast system will be able to support, to the amphibious penetration point, either traditional landing craft (LCUs) or two air cushioned landing crafts (LCACs) loaded with cargo and Marine vehicles and tanks. The well deck will also be compatible for launch and recovery of the Marine Corps�s 21st century amphibian, the Advanced Amphibious Assault Vehicle (AAAV). The combination of MV-22, LCAC, and AAAV greatly extend Navy and Marine Corps capabilities in support of Operational Maneuver from the Sea. LPD 17 will have significant survivability features and the latest in computer technology. In addition to Rolling Airframe Missile (RAM) protection from air threats, the ship is being designed to minimize its appearance as a target. Using radar cross-section (RCS) reduction techniques, the ship will not only have a new look, but will be more difficult to locate and target. Realizing that continuous leaps in technology are expected over the next 50 years, LPD 17�s fiber optic shipboard-wide area network (SWAN) will connect onboard-integrated systems. Computers resident on the ship will be in a "plug in and fight" configuration, allowing hardware to be more easily and appropriately replaced by newer technology as necessary over the ship�s lifetime. Moreover, LPD 17 will have extensive communications, command, control, and intelligence systems which will fully support current and projected expeditionary warfare missions of the 21st century. Advanced Enclosed Mast/Sensor. The AEM/S system, currently planned for the LPD 17 Class and being tested aboard USS Radford (DD 968), offers significant benefits for LPD 17 in terms of workload reduction, mast accessibility, and reduced RCS enhancements. However, its installation design necessitated an alternative for signal flag display which required ownership assistance. Late in 1997, members of the LPD 17 design team met with Fleet signalmen who had solved the problem by using collapsible signal posts to provide for full signal flag display capability when needed. Air Conditioning. 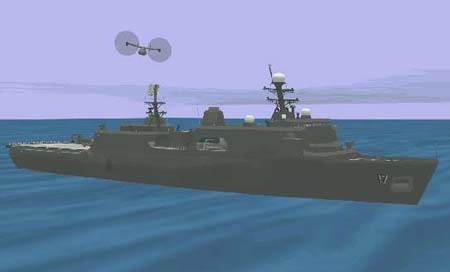 In 1997 both Fleet and Marine Corps commands expressed concerns about LPD 17 air conditioning capacity, recommending that LPD 17�s capacity be greater than that of the LPD 4 Class. This recommendation reaffirmed planning for LPD 17 which already included 1,400 tons of air conditioning-over four times as much as the LPD 4 Class. Attached Fuel Oil and Lube Oil Pumps. Fleet experience and data from various port engineers was the driving force in eliminating attached fuel oil and lube oil pumps. Traditionally, ships have used both an attached pump and an electric pump. However, the attached pump has often led to maintenance challenges. Using two electric pumps can capitalize on such efficiencies as common parts support, reduced maintenance workload, and reliability improvements. Electric pumps are planned for LPD 17. Automated Anchor Washdown System. A Design for Ownership suggestion led to the incorporation of an automated anchor washdown system on the LPD 17�s fo�c�sle. CIC and Troop Operations Design. A series of five joint Navy and Marine Corps workshops reviewed and revised the LPD 17 arrangements for the Combat Information Center (CIC) and troop operations spaces. Based upon real-world experiences in the Captain O�Grady Tactical Recovery of Aircraft and Personnel Operation, the new space design allows for equal access to information and situational awareness for both Navy and Marine commanders, while providing for the flexibility to transform the spaces into a single, integrated command and control center. Corrosion Control. Among the over 1,000 ownership generated issues, corrosion control was by far the most common. Many of the suggestions validated current LPD 17 ship design. For example, LPD 17 Class ships will have a titanium firemain; freshwater coolers will be used for the diesels; fittings and connectors will be protected from spray in the well deck; and topside external fittings will be non-corrosive. Additional initiatives are also being examined. These include improved tank coatings and corrosion-resistant designs in the well deck that will diminish this manpower-intensive burden. Passageway Design. Team 17 designers have directly interfaced with Marine combat cargo assistants to ensure that a combat-loaded Marine can move comfortably through the LPD 17 passageways. In addition, the Marine Corps forwarded an advanced copy of their planned 21st century backpack to Avondale Industries to ensure that the ship design will also meet future anticipated requirements. Ship�s Boats. Based upon Fleet input, the conventional ship�s boats that have been the mainstay of amphibious landings since Guadacanal will not be carried aboard LPD 17. A team of Fleet operators and maintainers from both the Atlantic and Pacific Fleets recommended replacing these boats with two 7-meter and one 11-meter rigid hulled inflatable boats (RHIBs). The approval of this action will save tons of ship�s weight, reduce acquisition costs, and provide support for embarked SEAL mission RHIBs. Medical Sterilization Room. During the 1998 Medical and Dental Workshop, Fleet participants identified a potential flow problem in the Sterilization Room as dirty medical instruments and material became sterilized. Fleet Surgical Team Six reviewed LPD 17�s space, and crafted a redesign that simplified the process flow and enhanced medical efficiency. Stern Gate Indicators. LSD Class ship Sailors recommended the installation of stern gate indicators in well deck control. At the 1998 Well Deck/Ballast Control Workshop, Navy and Marine operators designed LDP 17�s combined space "from the ground up," and incorporated stern gate indicators into their recommendations. Close Defense System. The original LPD 17 design included 25mm chain guns for anti-surface self defense. A Fleet input in 1997 recommended a stabilized gun to increase lethality. Team 17, working with the Marine AAAV program, determined that the AAAV 30mm gun system had increased firepower, better range, and greater accuracy; could be fired remotely; and required fewer maintenance hours. Sharing the same gun system with the Marine Corps would also achieve cost and workload efficiencies. Although no final decisions have been made, the AAAV gun is now being considered for LPD 17 Class ships. AAAV Close Defense System shipboard configuration. Continued interaction with Navy and Marine Corps Fleet users will remain the hallmark for the LPD 17 program. Design for Ownership sessions are already planned to review the pilot house and the Central Control Station (Main Control and Damage Control Central), while other sessions will examine additional key ship spaces. Ideas and suggestions received after LPD 17�s design is finalized will be considered for incorporation into later ships of the Class, including the recently awarded LPD 18 (USS New Orleans). Future Sailors and Marines who crew and embark on LPD 17 Class ships will quickly realize the value of the design contributions of their 20th century Sailor and Marine counterparts. LPD 17 is well on its way to becoming the right ship for the expeditionary warrior of the 21st century. For more information about LPD 17, visit the LPD 17 Home Page: lpd17.nswc.navy.mil (soon to be LPD17.com), or call the LPD 17 War Room: EWTGLANT: 1-800-445-1916. Gary Pickens is the Deputy Program Manager for NAVSEA�s LPD 17 Program Office (PMS 317). Rear Admiral (Ret.) Picotte is the Director of the Naval Expeditonary Warfare Program for American Systems Corporation.